For the Q1 2018 financial period, Apple registered a record quarterly revenue that saw the California-based giant report a revenue of $88.3 billion. While we got to know the reasons why the company managed to make so much money, here is when Apple is going to be releasing its Q2 2018 earnings. 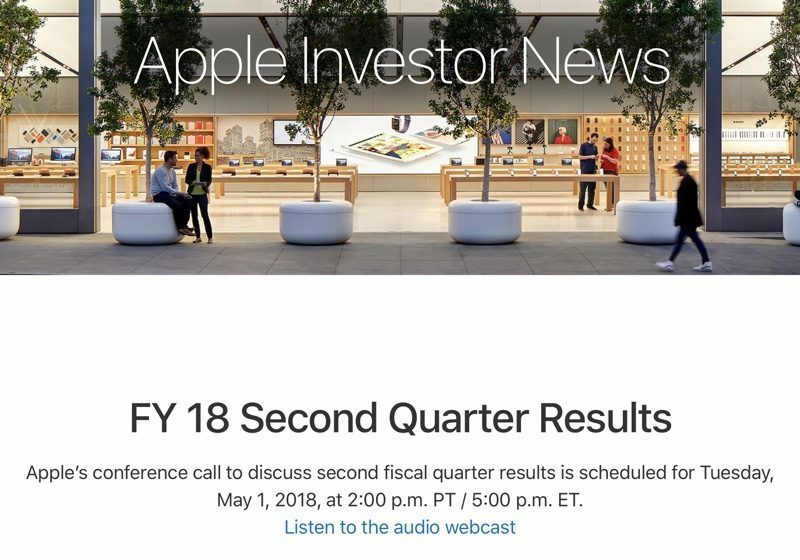 Apple has updated its investor relations page to announce that it will share its earnings results for the second fiscal quarter of 2018 on Tuesday, May 1. During this quarter, the earnings will provide a look at the sales performance of the iPhone 8, iPhone 8 Plus, and iPhone X following its record January quarter that saw the company sell a whopping 77.3 million iPhones, but that is still less than what Apple was expecting to sell. The company’s guidance for the second fiscal quarter includes expected revenue of $60 to $62 billion and gross margin between 38 and 38.5 percent. If Apple is able to achieve these results, it will beat its Q2 2017 earnings results based on those guidance numbers. Apple’s quarterly earnings statement will be released at 1:30 p.m. Pacific/4:30 p.m. Eastern, with a conference call to discuss the report taking place at 2:00 p.m. Pacific/5:00 p.m. With the release of the iPhone X, the average selling price of Apple’s primary ‘bread and butter’ product has gone up thanks to the increasing amount of technologies. Analysts have also voiced their opinions that if Apple continues to increase its iPhone prices like this, it could spell doom for the company, although we have yet to see any negative ramifications to selling expensive flagships for ourselves. For the 2018 iPhone lineup, the iPhone X Plus is going to be the biggest iPhone that the company has ever announced because it is expected to come with a massive 6.5-inch OLED screen and will be as big as the iPhone 8 Plus and cost $999 for the base storage model. The iPhone X successor could cost $899 as Apple intends on reducing the costs while attempting to incorporate better features in the upcoming lineup.